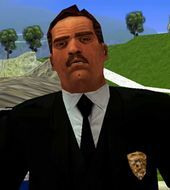 Leon McAffrey is a character in the 3D Universe who appears in as a minor character in Grand Theft Auto III (set in 2001) and as a supporting character in Grand Theft Auto: Liberty City Stories (set in 1998). He is a corrupt police officer working with Salvatore Leone, the Don of the Leone Family, and Toni Cipriani, a Leone Family made man. He is voiced by Ron Orbach, who has also appeared in Santa's Little Helper. Leon McAffrey was born in an unknown location in the United States and, at some point, joined the Liberty City Police Department, becoming a corrupt officer and making contact with Salvatore Leone, the Don of the Leone Family, eventually going on Salvatore's payroll. McAffrey finds that aiding criminals pays more than cop's salary ever could. In 1998 he is introduced to and employs Toni Cipriani to kill Sindacco Family members, lure the Forelli Family into an ambush with the Uptown Yardies, fight organised crime in Belleville Park, help the Uptown Yardies hold on to Newport and destroy Forelli weapons being transferred to a new location. Following the arrest of Salvatore Leone, McAffery phones Toni to say that the two never met, cutting ties with the Leone Family. He continues to work with the LCPD and with his new partner, Ray Machowski, a law abiding police officer who eventually also becomes a corrupt officer. As partners, Leon and Ray despised each other. Later on in 2001, Leon's links to the criminal underworld become evident to the LCPD. He agrees to turn states evidence against Machowski, now working for the Yakuza, in exchange for a dishonorable discharge. When Ray discovers this, he tasked Yakuza associate Claude to take out McAffrey, which he does while under police protection. In Grand Theft Auto: Liberty City Stories, it's possible that Ray Machowski was the original mission giver as a blue 'R' is seen on the map. Leon McAffrey during the mission Silence the Sneak.